Hidden from the main thoroughfare, Mario’s sits on a quiet corner just south of Queens Boulevard in Sunnyside. Its simple blue awning belies the sophistication of the cuisine found within. My Dining Partner (MDP) and I decided to try Mario’s about a week ago, when we were on a brief run to donate school supplies to the local library. We realized Mario’s was one of the few restaurants we hadn’t tried in our neighborhood. Italian food is sparsely found in Sunnyside, so Mario’s was a must-try. When we arrived, it looked like there weren’t many people inside, but, as we ate, more diners strolled in. We sat by the window at a small table for two and the waitress quickly came over to take our drink order (a half carafe of red sangria). Another waitress brought us some bread and our appetizer, which was a delicious plate of mozzarella and roasted red peppers. 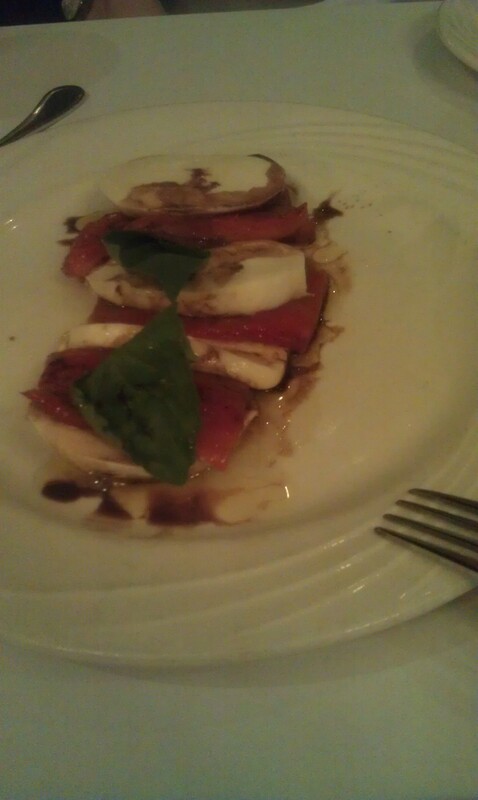 The mozzarella and peppers were drizzled with balsamic vinegar and olive oil. For our entrees, I ordered a special chicken dish with melted mozzarella and roasted asparagus with a sherry sauce, while MDP got a tortellini dish with mushrooms, peas and a cream sauce. My chicken was flavorful and perfectly cooked. The asparagus was crisp and the sherry sauce was slightly sweet. MDP’s tortellini were large rings filled with ricotta cheese, and the sauce was creamy and decadent. So satisfied with our entrees, we opted for dessert, a warm brownie with vanilla ice cream and whipped cream. Chocolatey and dense, the brownie delighted our taste buds. If you’re in the neighborhood, try Mario’s. Dazie’s, the other prominent Italian restaurant in Sunnyside, is pricier and satisfactory, but Mario’s definitely has a special edge.